The Keysight 35670A is available to buy refurbished used or rent, usually from our UK stock. Click here to download the Keysight 35670A datasheet. The 35670A lets you make laboratory-quality measurements in the field, on an automobile test track, flying above a city, or in the narrow confines of a submarine. Small enough to fit under an airplane seat, the 35670A is a two-, or four-channel (Option AY6) , FFT-based spectrum/network analyzer. The standard instrument provides spectrum, network, time-domain, and amplitude-domain measurements from virtually dc to slightly over 100 kHz. Your ability to solve problems in the field is enhanced with the optional four-channel 35670A measure noise at multiple locations inside vehicles, make triaxial vibration measurements, or gather data from several locations along a noise transmission path. With the 35670A, you carry all your measurement and analysis tools in one package. Octave analysis (Option 1D1 ) adds real-time measurements of 1/1, 1/3, or 1/12 octave spectra at frequencies up to 40kHz. Computed order tracking (Option 1D0) allows you to view spectra as a function of orders, or to view the amplitude of multiple orders as a function of RPM . Up to 8MB of additional memory (Option UFC ) provides deep transient time capture or extra space for up to four-hundred spectra. An arbitrary source (Option 1D4) lets you test devices with real-life test signals. With Instrument BASIC (Option lC2) , you can automate measurements or customize your instrument interface. Everything you need to troubleshoot vibration and noise problems in the field is in one instrument. (You can retrofit all options buy only the functionality you need today and add more as your needs change.). A deep transient time capture memory can record up to four channels of data plus a tachometer signal for playback in the narrow - band FFT, octave, order, correlation, or histogram instrument modes. Pre- and post-trigger delay functions let you capture the leading edge of one-time events or eliminate transmission delay in signals. 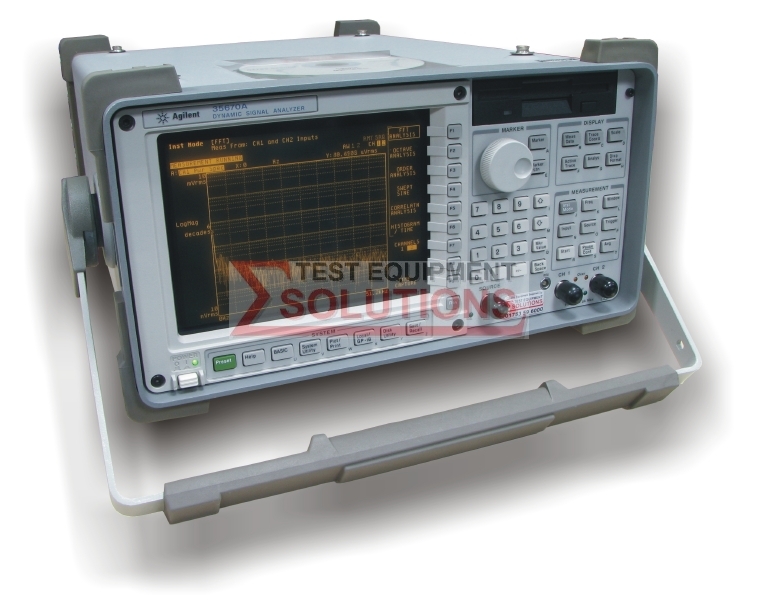 We offer the refurbished used Keysight (Agilent) 35670A 102KHz Dynamic Signal Analyser for sale and rental. The Keysight 35670A is fully tested and refurbished in our in-house ISO9001 calibration laboratory. We supply manuals, accessories, full warranty and a free-of-charge Certificate of Conformity. We can also provide the Keysight 35670A with a fresh calibration for a small additional charge. If you have under-utilised test equipment talk to us about trading-in or part-exchanging it towards the Keysight 35670A or other refurbished test equipment.